Arsenal to make first major signing ahead of 2016/2017 seasson. 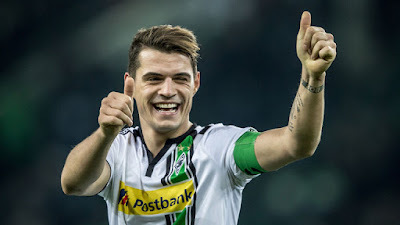 Arsenal is on the verge of completing the signing of Borussia moncheglabach midfielder Granit Xhaka, although the deal has not been formally completed. The 23 year old Switzerland international is high on winger's wish list in these year transfer window. Despite photos appearing to show Xhaka wearing an Arsenal shirt at the club's London Conley training base, which have been circulating on social media over the past 24 hours. Xhaka is flying to London to finalise his move to Emirate stadium, as revealed by a close friend of his. Xhaka is contracted to Monchengladbach until 2019 after joining them four years ago from Basel. The Bundesliga side confirmed on may 17 that they had received an offer for the midfield maestro. Arsenal is now ready to break the bank in other to meet moncheglabach's asking price of €30 million and a journalist and close friend Artan Muhaxhiri has confirmed on Facebook that Xhaka is travelling to London to finalize the move, previously spoken about his desire to play in the Premier League. He played the full 90 minutes in Switzerland's 1-0 defeat to the Republic of Ireland in Dublin in March and is expected to play a vital role in the forth coming Euro 2016 as the Switz chase their first major trophy in many years. Arsenal has also reportedly been linked to the likes of Avaro Morata who plies his trade for the Italian old ladies in Turin although facing a huge battle from his former club Real Madrid and fellow premier league side Chelsea who are all interested in his service. Also in their list is Newcastle playmaker Moussa Sissoko following the Magpies' relegation from the premier league. over the years, Arsenal has failed to bring it to the big party in transfer windows, taking into cognizance what happened to the likes of Sami Kedira and Gonzalo Higuain in the past years. The big question now is can Arsenal bring it to the big party this time? Only time will tell. So lets cross our hands and see what happens next. always visit our site for the latest sports and game updates. like Facebook page Blazing Info to see our latest posts. Remember all woks and no play makes Jack a dull boy. so I recommend Dream league soccer 2018 game for you to enjoy.